Here we are, it's the end of June and (as the song almost goes) June's been bustin' out all over! We've had some wonderful weather here in the UK over the last few weeks, and in other parts of the world I believe it's been very hot too. So one of the things we'll be looking at this month is how to keep your cats cool in the heat. Image with thanks to and copyright © AmyLyn Bihrle. 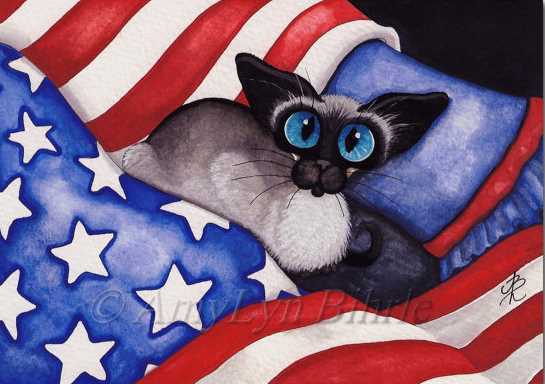 We have a couple of artist AmyLyn Bihrle's beautiful wide-eyed Meezer prints to share with you, and with the Fourth of July Independence Day celebrations and fireworks coming up, you'll find some topical tips on how to make the day as peaceful and comfortable as possible for your pets. Along the way we'll be taking a look at the exploits of a fictional derring-do Meezer by the name of Henry; I'd like your help with a page I'm updating; and there's exciting news of a very special fundraiser in aid of Siamese Rescue groups. Keeping your cats cool in hot weather is so very important to keep them happy and healthy. If you're in the Southern hemisphere, of course, you'll be heading into winter now but for those of us in the North, summer is starting to bring some sweltering temperatures. Cats enjoy warm weather and are fairly heat-tolerant, but like any other warm-blooded pet can suffer from dehydration and heatstroke when temperatures soar. With that in mind, here are ten tips for keeping your cat cool, healthy and happy in the summer months. Supply lots of fresh, cold water. This is important at all times but in hot weather water evaporates very quickly. Check bowls twice daily; clean them out and fill them up. Some cats like ice cubes added to their water - but some don't, so if you decide to experiment, always provide a choice of iced and non-iced water, and don't use too many ice cubes - one or two is plenty to keep the water fresh without over-chilling it. Feed wet food. Some cats don't drink enough water, a problem in hot weather. If you usually feed dry foods, consider switching to wet meals and adding water to them. Bandit loves licking the gravy off his food, and I've found that adding water to make extra gravy is a sneaky way of getting more fluid into him. Provide shade and airflow. Indoors (and outdoors, if your cat's allowed out) make sure there's a cool, quiet shady area they can retreat to. Keep curtains closed or shades drawn when the sun's on the windows. Rooms with ceiling fans to provide airflow are helpful too. Make 'cool spots'. Bandit loves lying on our cool, tiled kitchen floor when it's hot. Some cats choose to curl up in sinks, showers or baths, and laying wet towels down in these areas can help. It's possible to buy self-cooling mats for pets, but you can create cool spaces yourself by placing ice packs in cotton pillowcases in places where you cat likes to lie, or filling hot water bottles with ice cold water and placing them in cardboard boxes for your cat to find and use if they need to. Avoid too much play. Exercise generates heat, so keep play to a minimum in hot weather. Groom cats daily. In long-haired cats, matted fur can trap heat. Fur with no tangles will allow air to flow freely through the coat. Daily brushing for all cats removes excess fur, helping them keep cool. Check your outside buildings. Inspect sheds, greenhouses, and summerhouses before closing them up. Cats often creep inside for shade, but will dehydrate and die very quickly in a hot enclosed space without water. Avoid parked cars. Never leave your cat in a parked car. 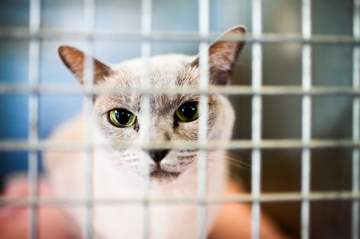 On trips to the vet or if you're taking your cat on holiday, make sure the cat's in a secure cat carrier, use air-conditioning if you have it, open the windows if you need to park, and stay with the cat to keep an eye on it. Check for dehydration. Pinch the skin at the back of your cat's neck. It should spring back immediately. If it doesn't, chances are they're dehydrated. Dehydration can be serious - seek veterinary advice. Watch for signs of heatstroke. Panting, drooling, vomiting, listlessness or lethargy, dilated pupils and a rapid heartbeat are all signs of heatstroke. If you notice any of these, take your cat to the vet immediately. You can help to cool your cat down on the way by sponging their heads and coats with cold, damp, towels. One of our readers (thank you, Janet!) 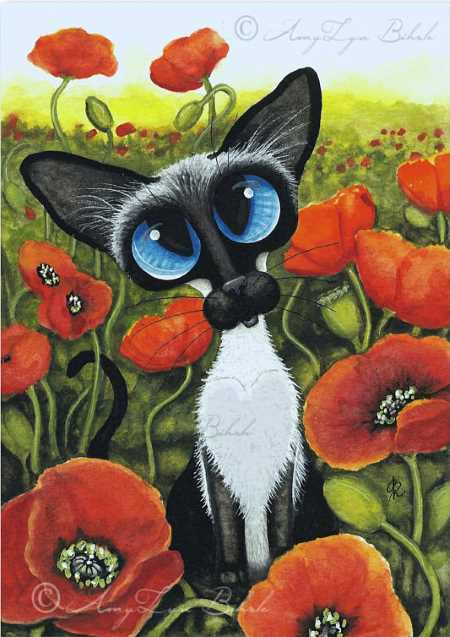 wrote to me a couple of months ago to remind me that in addition to the perhaps better-known Skippyjon Jones books, there's another delightful series of Siamese cat books for children. They're great for reading aloud, or for children to read on their own. 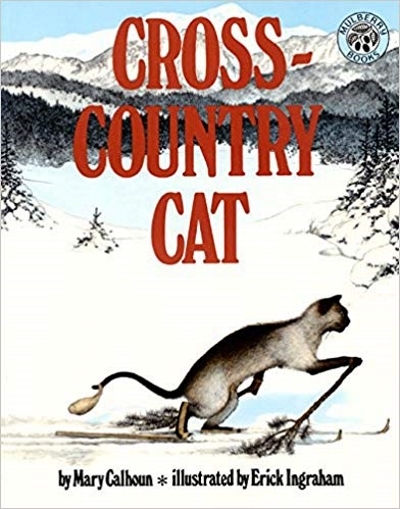 Written by Mary Calhoun and illustrated by Erick Ingraham, they feature a curious, courageous and very adventurous Siamese cat called Henry. I'll be adding an individual page about the books to this site soon, but thought I'd mention them here in the meantime. The first book, Hot-Air Henry, details Henry's fur-raising exploits as he stows away in a hot-air balloon, ends up piloting it himself, and, after a number of mishaps, lives to tell the tale. In others, he skis, sails, rescues a puppy from a high ledge, and helps to reunite a little girl with her family when she gets lost at a country fair. You'll find the full list of books below with links to Amazon where you can find more details about them all. Fourth of July Coming Up! The Fourth of July is nearly upon us, so, to our American friends, we wish a very happy Independence Day, and joyful celebrations. I wouldn't want to take anything away from the fun of the holiday, but all those fireworks, bright lights, flashes and bangs aren't always so enjoyable for our pets. Our Topical Tips, below, will help you make the celebrations as peaceful for them as they're fun and joyful for you. Keep your animals inside. Make sure, before the fireworks start and the noise begins, that your cats are securely housed in a quiet room where they won't be affected by any unusual comings and goings and, especially, won't be able to escape outdoors. In your quietest room, make a hideout for your cat and create a safe space there with beds, toys, food, water, litter tray and any other comforts, to provide a haven for them while the festivities are going on. Close windows and doors, and draw curtains or blinds to help limit the noise and light flashes that comes into the house. If your cats enjoy music, you could have some playing quietly in the background to mask some of the outdoor noise. Keep (yourself and your cat) calm. Pheromone plug-ins or sprays like Feliway can help keep your cat calm so spray it in your safe space. Staying calm yourself and not reacting to loud noises also helps to reassure your cat that nothing is badly wrong. Taking in and nurturing abandoned kittens, socializing and finding homes for cats in hoarding situations, re-homing cats for owners who for one reason or another can no longer keep them, pulling Siamese cats out of shelters where the risk of euthanasia is high ... the Siamese Rescue organizations around the world, generally staffed by volunteers, do amazing work. I've heard so many stories recently, both utterly heartbreaking and utterly heart-warming. And I'd love your help! I'm in the process of updating my Siamese Rescue center page. If you have a Siamese Rescue anywhere near you, would you hop on over to the page and check that it's listed? If it isn't, or you know of any other Siamese Rescues that aren't shown there, do please drop me a line through my Contact page and let me know. Last month I wrote about Jo McLaughlin and the Facebook group she set up, Meezer McLocks. I'm thrilled to tell you that the wonderful admins who took over the group after Jo's death, and now run it in her memory, came up with the idea of holding a series of very special fundraising events in aid of Siamese Rescue. Tao & Titania's Tombola Fundraiser (all sorts of gifts and goodies and open for bidding now), Fu & Roms Buck Boosting Blanket and Bed Auction (lots of pretty crocheted blankets and beds) Henri and Wilbur's Terrific Toy and Treat Auction (spiders and wands and lemurs and mousies, oh my!) 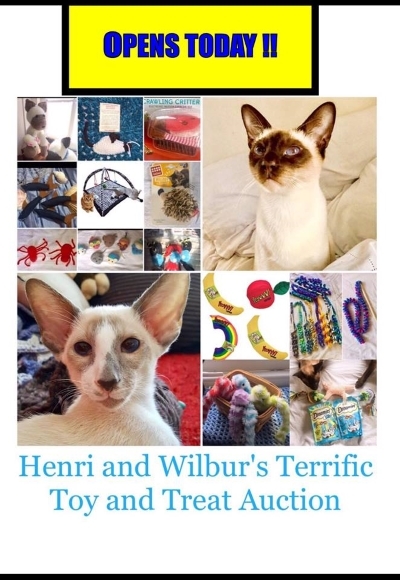 all sorts of goodies generously donated by group members and some very special companies for members to bid on in the Meezer McLocks Siamese Rescue Fundraiser. If you're on Facebook and haven't already joined the group, it's a great place to hang out and share photos and stories with fellow Meezer-lovers. If you're already a member, make sure you take a look through all the amazing fundraising activities, and be ready to make some bids. Which reminds me ... Bandit has told me that he really, really wants a stripy lemur, so, now that I've finished writing this, I must go and do the same! Have fun, and give generously! A friend of mine who lives in New Zealand recently told me that it's freezing there right now. We always envy her, though, when they're having great weather and beach parties in December! So if you, like me, are in the northern hemisphere, make the most of the warm, sunny weather and enjoy the summer. Winter will be here again before we know it. That's it from us for now, we'll be back at the end of July. 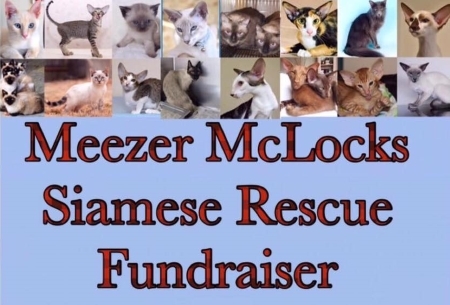 Meanwhile, don't forget to go and join in with the Meezer McLocks fundraising party!